Buffalo Dance is an 1894 American 16-second black-and-white silent film shot in Thomas Edison’s Black Maria studio. 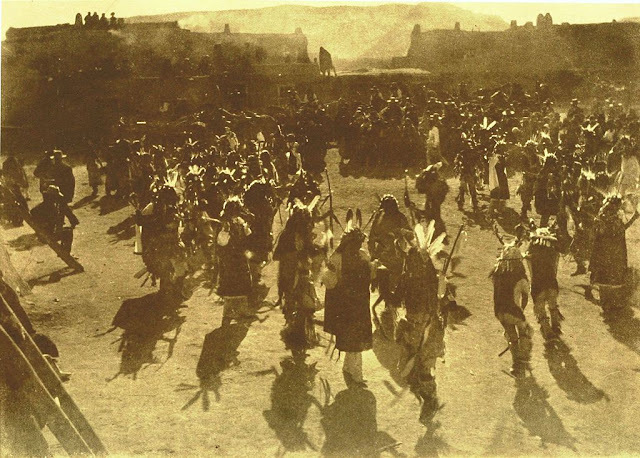 The film was made at the same time as Edison’s Sioux Ghost Dance. It is one of the earliest films made featuring Native Americans. In this film, produced by William K. L. Dickson with William Heise as cinematographer, three Sioux warriors named Hair Coat, Parts His Hair and Last Horse dance in a circle and two other Native Americans sit behind them and accompany them with drums. According to the Edison catalog, the actors were ”genuine Sioux Indians, in full war paint and war costumes.” They were also apparently veterans of Buffalo Bill's Wild West show. The Sioux are groups of Native American tribes and First Nations peoples in North America. The term can refer to any ethnic group within the Great Sioux Nation or to any of the nation’s many language dialects. The Sioux comprise three major divisions based on language divisions: the Dakota, Lakota and Nakota. The buffalo dance is a prayer to the gods of the chase. Photo by E. W. Deming, San Ildefonso, 1893.